Phosphorus (P) deficiency negatively effects cattle mortality rates, growth and breeder efficiency. In central Queensland, a strategy of supplementing breeders with P during the wet season only resulted in greatest profitability for Marginal, Deficient and Acutely P-deficient herds: $7918, $17 967 and $48 216 extra profit/annum, respectively. However, supplementing breeders with P in any season substantially increased profitability for herds running on Deficient or Acutely P-deficient country. The very large economic benefits of P supplementation, where a deficiency is identified, provides justification for adopting effective supplementation strategies. Phosphorus (P) deficiency occurs in cattle grazing in many rangeland areas of northern Australia due to low soil P and can substantially reduce cattle growth and breeder productivity. Phosphorus deficiency results in poor appetite and feed intake, poor growth, high breeder mortality, reduced fertility and milk production, bone breakages and, in severe cases, bone deformities. Feeding a P supplement to P-deficient cattle has been shown to increase feed consumption by 10-60%, growth rates of young stock by 30-40 kg/year and weaning rates by 10-30%. The greater the soil P deficiency, the greater the cattle response to P supplementation. Department of Agriculture and Fisheries (DAF) staff have determined the implications of P supplementation strategies on the productivity and profitability of beef enterprises in central Queensland as part of the project ‘Delivering integrated production and economic knowledge and skills to improve drought management outcomes for grazing enterprises’ funded by the Queensland Government’s Drought and Climate Adaptation Program. Analyses were conducted for three case study properties each with a different level of breeder herd P deficiency: Marginal, Deficient or Acute (defined as 6-8, 4-5 and 2-3 mg/kg Colwell P in the top 10 cm of soil, respectively). Supplementation regimes designed to provide P in the wet and/or dry season were assessed. The effect of P supplementation was assessed by comparison to baseline production systems with no effective P supplementation for breeders. Property-level herd models were used to determine the whole-of-business profitability over a 30-year investment period. In this study, it was assumed that steers and heifers grazed P-adequate soil types (>8 mg/kg Colwell P) after weaning and did not require P supplementation. The case study properties were a total area of 8700 ha with a carrying capacity of 1500 adult equivalents. The properties were a mix of native and sown grass pastures with the breeding herd grazing the less productive, forest country and the steers and heifers grazing more productive land types sown to buffel grass pastures. Feeding effective P supplements to P-deficient breeder herds decreased overall breeder deaths, increased female sales as a proportion of total sales and increased weaners produced per total cows mated. Particularly for Acute P status country, the changes to rates of cattle mortality, fertility and growth resulted in substantial changes to the structure of the herd over time. For example, an Acutely P-deficient breeder herd, after implementing wet season P supplementation, ran 50 fewer breeders but produced 20 more weaners on average compared to a property without P supplementation. In addition, the herd supplemented with wet season P produced 53 more cull cows and heifers and 10 more sale steers on average than the herd not supplemented with P.
The returns from P supplementation increased with increasing P deficiency of the breeder herd. The additional profit generated per annum from a wet season P supplementation program was $7918, $17 967 and $48 216 for Marginal, Deficient and Acutely P-deficient herds, respectively. Feeding P to breeders during the wet season only, produced relatively larger returns than supplementing with nitrogen and P during the dry season or supplementing with nitrogen and P during the dry season combined with P supplements during the wet season. However, for breeder herds considered Deficient or Acutely deficient in P, supplementation with P in any season substantially improved profitability: range $9025-$48 216 extra profit/annum. The feeding of nitrogen and P during the dry season, or nitrogen and P during the dry season combined with P supplements in the wet season, increased the net costs of feeding without any assumed performance improvement above and beyond the feeding of wet season P alone. In this analysis it was assumed that cattle achieved the target intakes of P in each season. 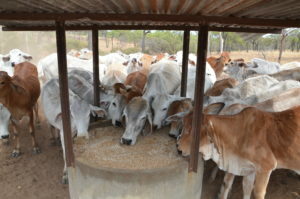 However, on commercial properties there can be practical and logistical difficulties in feeding supplements during the wet season and in achieving target intakes of P. Under these circumstances, these analyses indicate that it is still very profitable, for herds with Deficient or Acute P deficiency status, to feed supplementary P in the dry season alone or year-round. The value of the financial benefits to any individual property will also be dependent upon any additional capital and feeding out costs associated with achieving appropriate P supplement intakes. These costs were not included in this analysis due to their highly variable nature but should be accounted for when benefits of P supplementation are being assessed for individual properties. The major driver of the improved profitability due to P supplementation was the effect on breeder mortality. The decrease in maximum cow culling age that can often occur with improvements in herd productivity will further improve economic performance, where it occurs due to P supplementation, as well as reducing drought risk of the beef business. These results reinforce the best-practice industry recommendations to determine existing levels of P deficiency before undertaking any supplementation program. Where no biological response to P is expected (P-Adequate country) then there will also be no economic response to P supplementation. The full details of these results, as well as analysis of a range of other management strategies relevant to beef businesses in central Queensland, can be found in the following report: ‘Fitzroy beef production systems: Preparing for, responding to, and recovering from drought’. The potential benefits of P supplementation should be examined on a property-by-property basis to account for property-specific details of location, operational scale, land capability, climate, herd performance and existing management practices. DAF economists and beef extension staff are available in central Queensland to conduct personalised economic analyses for producers, to assess the potential benefits of P supplementation at the property level. Please contact Matt Brown if you would like the DAF beef team to visit your property; email: matt.brown@daf.qld.gov.au or for other areas call 13 25 23.